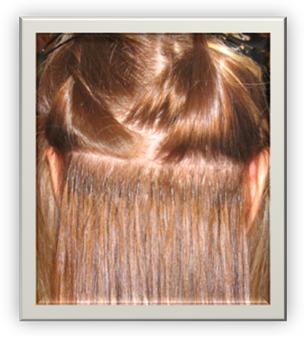 Our bonds are Italian keratin protein which mimics the human hair’s molecular structure. This makes it easier to maintain, less damaging and compatible with elements such as heat, water and sunlight.The bonds are the same colour as the hair and when fused to the natural hair they are barely visible. Ultrasonic application machines give the versatility of flat and round bonds. Flat bonds give a seamless, more fluid result while round bonds achieve more volume.Application times vary depending on the natural thickness of your own hair and the amount of strands required, toachieve your desired look. Very easy to maintain, providing the correct after care (link here) procedures have been followed. We provide all clients with Maintenance Guides with tips to keeping your hair in tip top condition. You care for your luxury hair in much the same way as you would your natural hair. Even brushing is the same ensuring you use your extension soft bristle brush, provided in your aftercare pack.